All transactions are safe and secure with a reliable history in online purchasing behind each of our associates. Buy the Bates Motel t-shirt to own Alfred Hitchcock clothing and merchandise. Let everyone know that you're employed by the Bates Motel. In addition to your normal duties, you also do odd jobs like burning the guests clothes, dumping their cars in the lake, sharpening your boss's knives and cleaning what looks like blood stains off the shower curtains. Of course, there was also that time when your boss Norman asked you to buy him the nicest old lady's wig that you could find. This Bates Motel Staff shirt is a fun tribute to the cozy getaway where the guests always rest in peace. 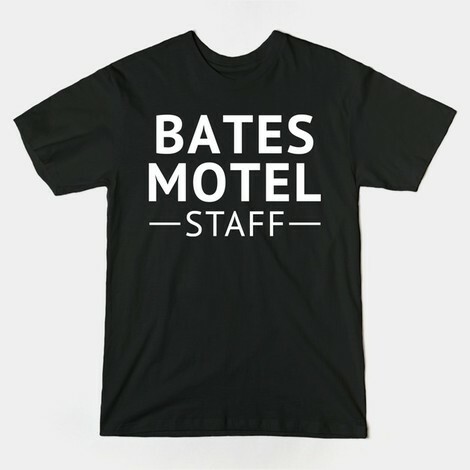 In addition to the Bates Motel tee above, browse the Alfred Hitchcock Clothing Gallery for more apparel like men's and women's clothes, kids shirts or hoodies.